يقع Daintree Rainforest Bungalows في خليج البقر / كاو باي, داينتري, هو خيار شائع بين المسافرين. يمكن من هنا للضيوف الاستمتاع بسهولة الوصول إلى كل ما تقدمه هذه المدينة النابضة بالحياة. بالنسبة لمن يريد الخروج، هذه بعض المعالم السياحية المتوفرة للزوار ‪Floravilla Ice Cream Factory & Art Gallery‬. استمتع بالخدمات الراقية والضيافة التي لا مثيل لها بهذا الفندق في داينتري. يقدم الفندق واي فاي مجاني في جميع الغرف, مرافق مخصصة لذوي الاحتياجات الخاصة, تسجيل وصول/خروج سريع, تخزين الأمتعة, واي فاي في المناطق العامة لضمان الراحة القصوى لضيوفه. استمتع بوسائل الراحة الراقية في الغرف أثناء إقامتك هنا. بعض الغرف تتضمن غرف لغير المدخنين, مكتب, تليفون, مروحة, تلفزيون لمساعدتك على استعادة طاقتك بعد يوم طويل. سواء كنت من محبي الرياضة أو كنت تتطلع لتفريغ عناء نهار صعب، ستجد خدمات ذات مستوى عالي بانتظارك كمثل شاطئ خاص, ركوب الخيل, حديقة. مهما كانت دواعي سفرك فإن Daintree Rainforest Bungalows هو خيار ممتاز لإقامتك في داينتري. يُرجى العلم أن عقار "داينتري راينفوريست بنجلوز" يقع في خليج "كاو باي" على الضفة الشمالية من نهر "داينتري". يمكن الوصول إلى الضفة الشمالية من النهر عن طريق العبّارة فقط، وتعمل العبّارات لساعات محدودة بدءًا من الساعة 6:00 صباحًا إلى منتصف الليل، وتقل أعداد العبّارات في بعض العطلات الرسمية. Excellent experience again, have stayed once before. Much nicer experience then the larger sites. Would recommend. Amazing place. In the middle of the Daintree Jungle. Both peaceful and noisy in that the local birds and insects create a cacophony of sound which we loved. Not a place for people who need their phones/WiFi or hairdryers. Do take bug spray. My husband and I had a lovely stay in this beautiful setting. Ed and Karen made us very welcome. The bungalow was very comfortable and well equipped. Details such as washing up liquid, salt, pepper and cooking oil were much appreciated. My husband loved this place but it really didn't do it for me. It is no where near anything which I guess is the point. I struggled with the lack of facilities, air con, wifi and phone signal. However, if you are looking to get away from all those modern conveniences and escape distraction then this place might be for you. Manager/ Owner couldn't be more helpful.. Always asked us when he saw us if there was anything we needed. Very well equipped bungalow. Had a great time.. The facilities at the bungalow are excellent. There are some minor supplies in the bungalows like salt, pepper, tea, coffee, crockery, cutlery and cooking utensils. There is no internet or mobile phone access at the bungalows, so bring a book. We had a wonderful stay. 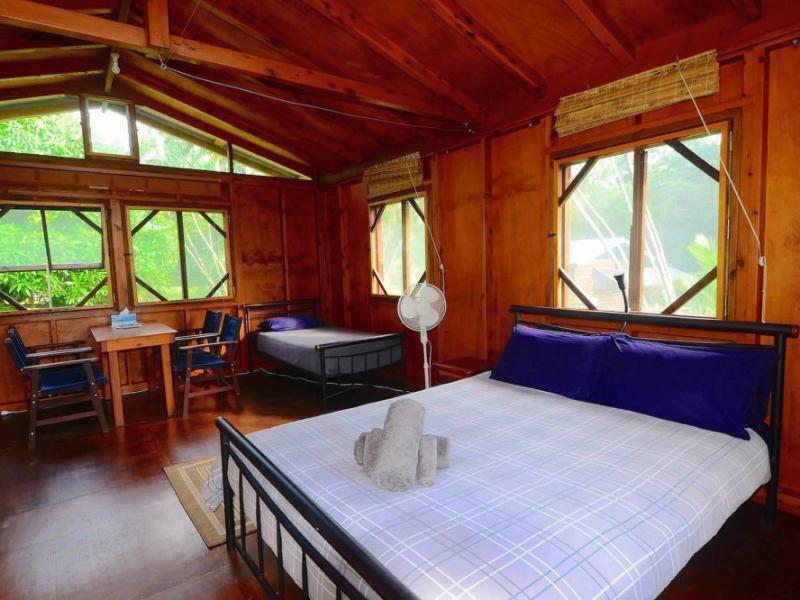 We highly recommend this place to others looking for a perfect Daintree Rainforest location away from backpacker hostels and in the middle of the beautiful rainforest. Our cabin was exceptionally clean and well-equipped for self-catering. It was a great value for the area. The incredibly friendly and helpful owner. 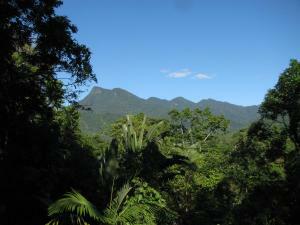 This is a great location for access to the wonders of Cape Tribulation. Fabulous value for money. This was our first time at Cape Tribulation and we will definitely stay here again. The cabin was clean, bug free, and anything we needed, or didn't even know we needed, was cheerfully supplied by the wonderful owner, Ed. He made us feel like family. Top marks! Nous avons vraiment apprécié notre lodge. L'impression de dormir dans la rainforest. C'est le meilleur hébergement de tout notre séjour. Die vier Holzhäuser liegen weit genug auseinander, es ist sehr ruhig, nachts herrscht Totenstille. Es gibt kein Internet aber das hält man auch mal so aus. Der Besitzer ist sehr nett und hilfsbereit. In der Abenddämmerung sieht man auch Flughunde.